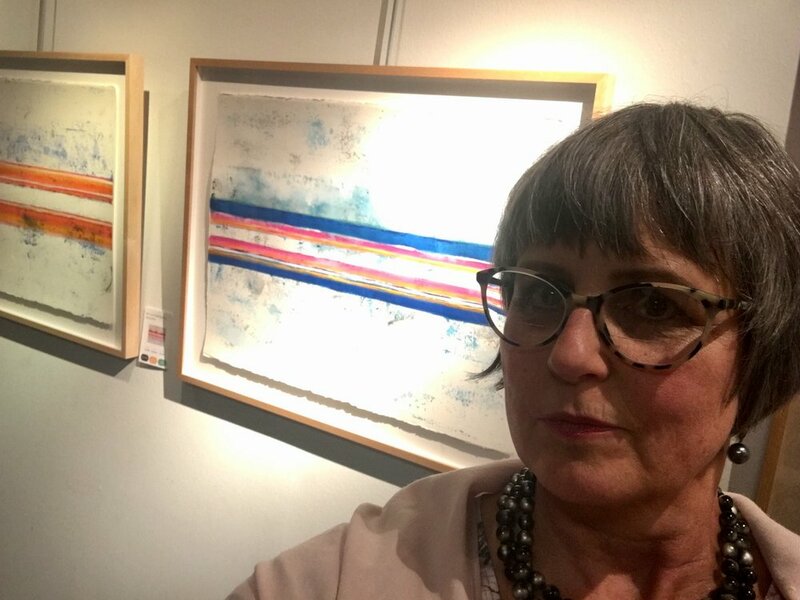 An exhibition of Women’s Voices, featuring six renown female artists – Laura Berman, Jane Booth, Teresa Dirks, Cheryl Eve Acosta, Katrina Revenaugh and Robin VanHoozer – who use color, shape, and lines as a cultural currency to convey rich conversations and take risks. They see beyond what is there and re-present it in seemingly confident and courageous ways. You are seeing abstract thoughts put into practice. This exhibition is curated by Susana Bruhn, Director of GUILDit – Kansas City’s forum where art and business fuse. All six artists are GUILDit alumnae who have taken great strides in the business aspect of their work so that all areas of their work may flourish. Thank you GuildIt and Susana Bruhn for the opportunity. First Friday: Your sweetheart wants art and chocolates for Valentines ❤️ Day. . . Your sweetheart wants art and chocolates for Valentines ❤️ Day. . .
Join us and find your little jewel. Join us for February First Friday 2/2/18 in the Crossroads! 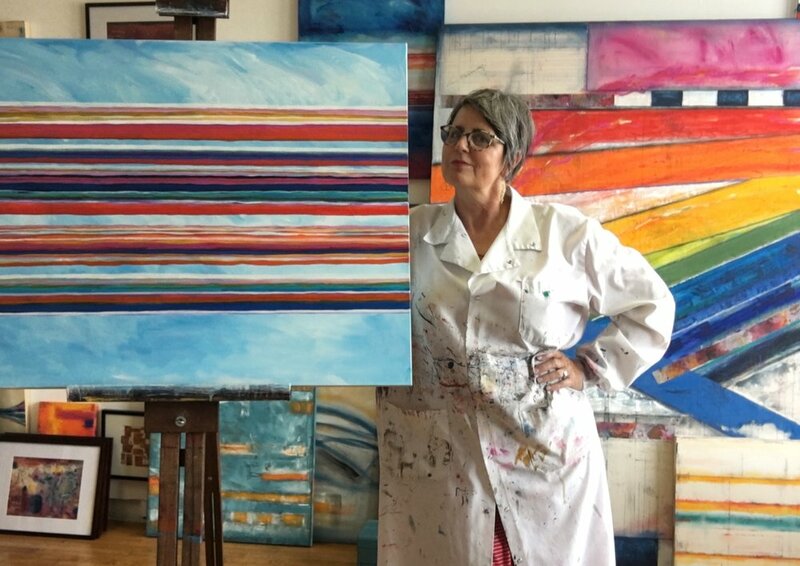 This is an excellent opportunity to invest in an intimate original Teresa Dirks. Fine art makes a unforgettable gift for Valentine's Day. A variety of new small intimate works and price points are being offered. Add to your collection or wow someone with a truly spectacular gift. Come get acquainted with me, hear about my inspiration and my process, and visit with my family and friends in a welcoming environment. Come share the love. If you haven't discovered my work yet, February First Friday is the perfect time. We are upstairs above the Leedy Voulkos Gallery at Studio Above with several other artists. See you soon! Open Studios are at the Livestock Exchange Building, 1600 Genessee, Kansas City MO, Friday, August 4, 4:30-9 & Saturday, August 5, 10-2 pm. Artists and businesses in the Livestock Exchange Building are excited for you and your friends to join them in the second event of 2017. Join us for the last reception on May 19 from 4:30 till 8! The show hangs until June 11. Thinking of a private Fall show. Any thoughts? If you are interested, please sign up on my contact page. Also if you would like to make a studio visit to see more of my work and talk about the painting process, you may also contact me there. Please join us at Plus Modern Design tomorrow night for their Reopening First Friday Event. Knowing Keith's amazing design work, I cannot wait to see the new space. By the way, I will have several works at the remodeled showcase including my newest work, "For Our Sons and Daughters." Hope you can join us.